The legacy Deltik products were creations of the Deltik community from 2008 to 2011. This package contains the files and folders that were in https://products.deltik.org on Friday, 09 September 2016. Deltik decided to export the legacy products because some ran as live demos on the site and were known to have security and performance flaws. Some items were excluded or modified for privacy or legal reasons. Not all legacy Deltik products were put on the products site, so some products aren’t in this package either; however, this package does include some unpublished products that were set up on the site anyway. The files in this package can be copied to any web server running PHP 5, and the products should run roughly as they did on Deltik. Note that some paths were hard-coded and may break on your web server if you aren’t pretending to use the virtual host products.deltik.org. This command puts the legacy Deltik products in a folder called products-legacy/products in the current directory. Products that had a demo setup for live demonstrations and releases for downloading the products were considered “published”. These products are in the pub folder. Artificial Intelligence Chat (aigui) was a proxy and unified chat interface for A.L.I.C.E., Lauren, Elbot, Kyle, Splotchy, and Sensation Bot. The code was not designed to be extensible or maintainable. The screen-scraping strategy was poorly concocted, and the communications between the user and the proxy server use an unusual and unreliable custom format. Log2Log PHP (log2log) was a chat log converter as a web service. The implementation is very CPU- and RAM-intensive. Privacy was not properly considered when developing this product. As a result, Log2Log as client-side software succeeded Log2Log PHP. Multiple Server Status Pinger or MuSeSPinger (musespinger) was a distributed web server status checker that could check the up or down status of multiple remote hosts in one query. MuSeSPinger could be configured in a network of MuSeSPinger nodes to check the status of remote hosts from different locations. PHP History Hider (phphistoryhider) was a page where you could enter any URL, and the site would be displayed in an <iframe> on the page. Your browser history would show “PHP History Hider” instead of the titles and URLs of the pages you visit. Why would you want this? Modern browsers have private browsing mode. Besides, PHP History Hider doesn’t prevent sites from storing cookies and caching items in your current browser profile. The folders that aren’t pub were considered unpublished products. They were never before released for download on Deltik. 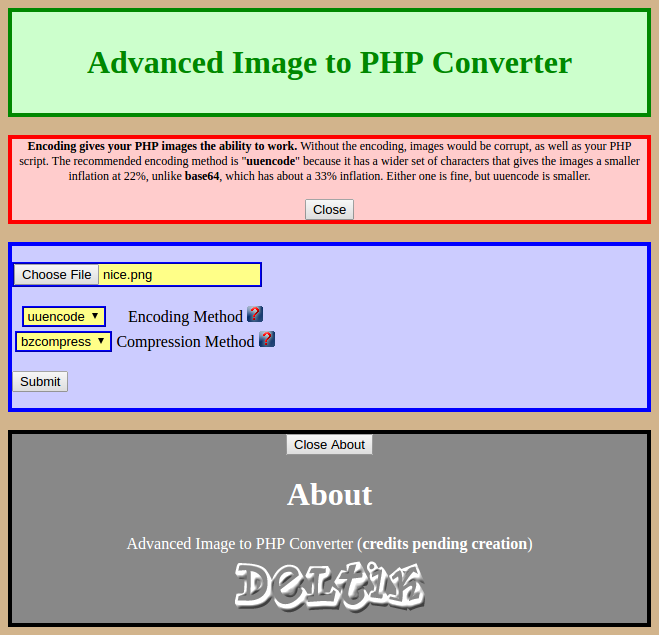 Advanced Image To PHP Converter (img2php) was an unimplemented web service that took image uploads and converted the images into PHP functions that returned the original image for serving to visitors. Only a web page with no functionality was written. In most cases, it makes a lot more sense to have the web server serve a pure image rather than to invoke PHP to decode a string and output it as an image. The intention of this tool was to help make scripts so portable that they could include images in just one index.php file. This product was not completed because it wasn’t expected to be very useful. 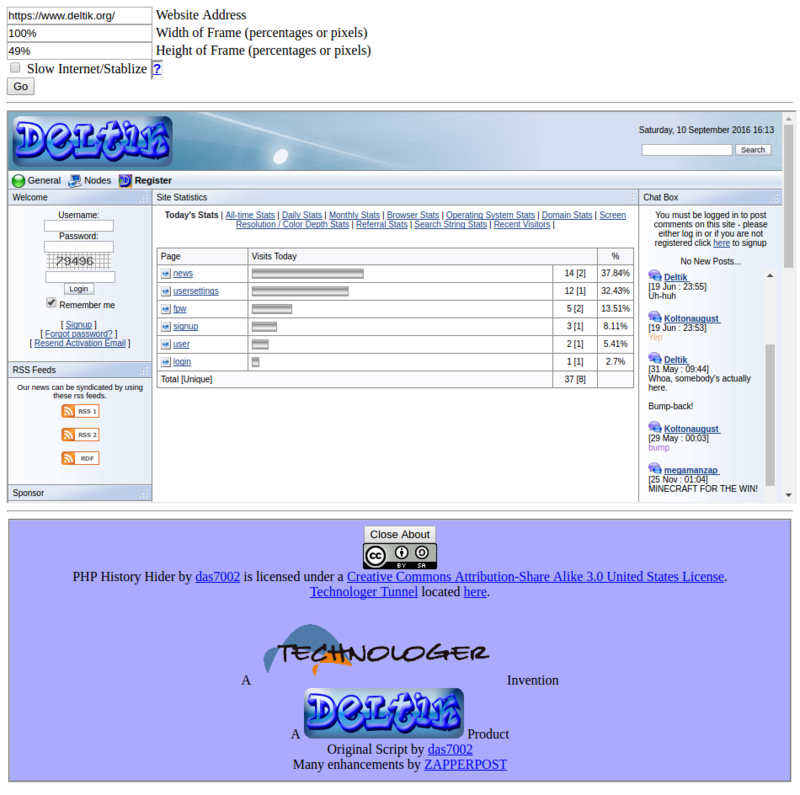 IsMyChat (ismychat) was a planned web chatroom system, intended as a replacement for and expansion of the community chatroom at IsMyWebsite. IsMyChat initially borrowed code from Kweshuner but did not get anywhere close to a viable product. There was no reason to reinvent a web messaging platform, especially if the reinvention was done poorly as was the case with IsMyChat. A frontend to Internet Relay Chat would have obviated IsMyChat anyway, and such frontends do exist already. 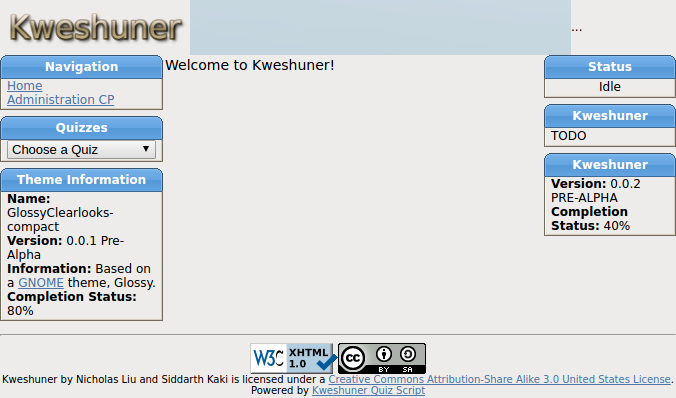 Kweshuner (kweshuner) was a planned online quiz and survey system that parsed forms from a custom format that was intended to be easy to learn. There is no working implementation of Kweshuner. Other learning management systems already do better what Kweshuner was supposed to do. The custom format is worse than XML and much worse than YAML. The Deltik Linux Resources (linux) were a collection of documents that tried to convince readers to switch their operating system from Microsoft Windows to Linux. linux/aboutlinux.php was the original essay. The target audience was early secondary school students. linux/linuxupdated.php was a planned update to the original essay to address criticisms. linux/index.php was planned as a Kweshuner quiz to recommend a Linux distribution to users. This quiz was drafted but not completed because Kweshuner did not become a viable product. linux/fedora-vista.html was a table that compared select features from Fedora 9 with Windows Vista. linux/ubuntu-7.php was a table that compared select features from Ubuntu 9.04 with Windows 7. The documents were biased to the point of being inaccurate. They were not updated or corrected. The views presented in the documents do not necessarily reflect the views of Deltik today. Loguntu (loguntu) was a planned file and chat log hosting service. It was expected to integrate with Log2Log to provide universal chat logs across all supported instant messaging clients. No features of Loguntu were implemented, but some file storage tests were performed to evaluate storage strategies. Development of the upstream project of Loguntu, Log2Log, was suspended, which made Loguntu moot. There were plans to repurpose Loguntu as a semantic desktop manager, but they did not pass feasibility considerations. 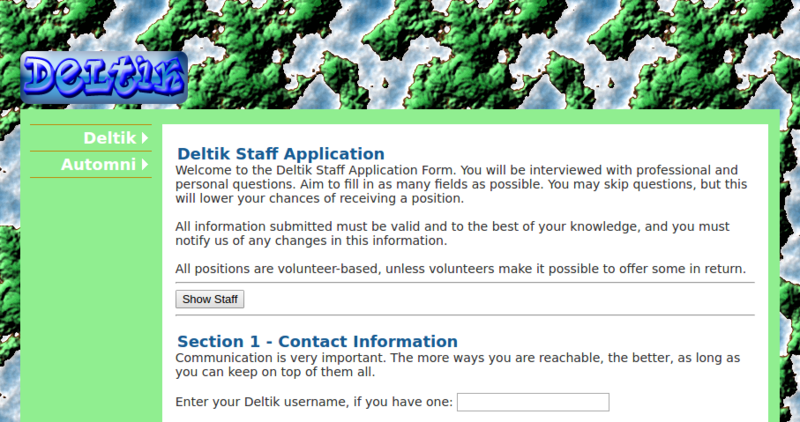 The Deltik Staff Application Form (staffapp) was a form to apply to be a volunteer for Deltik. Upon submission of the form, a sendmail email would be sent to Deltik. Deltik became less community-oriented over time and no longer sought administrators, developers, or moderators to support the site. WebDeb (webdeb) was a planned port of dpkg to PHP. WebDeb would have been the package management system for the planned content management system Automni. 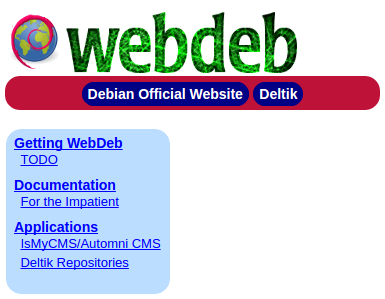 Automni was to Debian as WebDeb was to dpkg. Automni was discontinued, which made WebDeb unnecessary. Other content management systems proliferated, and Automni was not exceptional enough to be worth pursuing.